Here at 1st Choice Health & Wellness, our wellness team lives up to its name by providing a wide range of holistic healing and wellness support measures to help you enjoy the highest quality of life possible -- and for many people who have trouble with undesirable fat distribution, fat loss is one of those measures. That's why we're excited to announce that we are now offering Zerona, a revolutionary non-invasive body contouring procedure that can help patients lose inches of fat over the course of a number of treatments. If you hesitate to submit to painful, damaging surgical methods, you'll be happy to know that Zerona Z6 technology allows you to contour your body with no surgery and no pain. Zerona is an FDA approved low-level cold laser treatment that removes inches of fat from the hips, waist, thighs and arms. Treatments are recommended for individuals who want to reduce fat in areas that are difficult to tone through diet and exercise. Excess fat is a constant worry in today's world, with obesity becoming a dangerous epidemic in developed countries worldwide. But even after you have worked hard to shed excess pounds that threaten your joints and systemic health, you may be left with areas of unattractive fat that simply refuse to go away. That's partly due to the fat cells never actually disappear (unless you surgically remove them); they naturally expand and shrink to hold more or less fat, and not all fat cells perform this task in a uniform manner. In the past, people who wanted to remove extra bulges on the body had to have liposuction performed-- an invasive process that causes pain and bruising while robbing your body of an essential functional component. Today, however, low-level or "cold" laser therapy has made fat removal safer and easier than ever before -- and Zerona Z6 is the pinnacle of that advancement. Zerona works by using a low-level laser that emits no heat. A "cold" laser is one that passes through the skin without harming it to provide beneficial effects to the tissues underneath. In the case of Zerona Z6, the benefit is removing fat from fat cells without actually removing the fat cells themselves. The laser beam emulsifies the fat so that it can freely flow out of the cell. It also allows a tiny hole in the cell membrane called a transitory pore to open so the fat can escape into the lymphatic system and be eliminated by the body. This body contouring procedure can actually help you lose inches of fat over the course of a number of treatments-- and at no time will you experience any pain, bruising or other after-effects that might keep you from your work or daily activities. √ Non-invasive: No surgery needed. That means no pain and no recovery time needed. 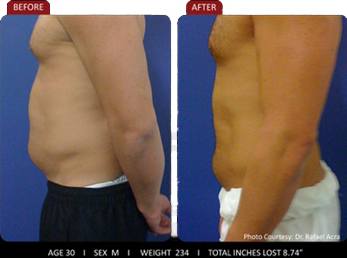 √ FDA-Approved: Zerona is the first and only laser with FDA clearance to lose fat. A Zerona Z6 treatment sessions typically takes about 40 minutes, but you'll find those 40 minutes extraordinarily easy and relaxing ones. All you have to do is lie on the treatment table and read, doze or otherwise take it easy while the laser does all the work. You will, however, be advised to avoid alcohol and caffeine (for best results) and stay on a healthy diet and exercise routine until the sessions have been completed. If you're considering body contouring in New Albany or Louisville, see what Zerona can do for you. 1st Choice Health and Wellness. Request your complimentary laser fat removal consultation online or call (812) 945-4500 for an appointment or for questions about this amazing body contouring procedure! For more information on Zerona Z6, click here!